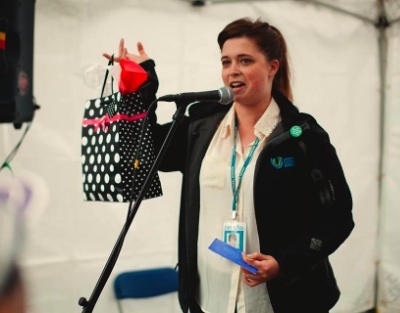 Around Town: UGM connects, Voices Together, Word Guild winner . . .
Union Gospel Mission hosted 40 agencies which offered free services to the Downtown Eastside community June 18. Photo by Andrew Taran. Union Gospel Mission is a particularly busy place these days. At Summer Connect, on Wednesday (June 18), they hosted 40 other agencies offering a variety of free services, and next Wednesday (June 25) they will open their newly renovated building for women. Princess Street was blocked off for Summer Connect, to make room for tents housing a wide range of groups which provided, at no charge, legal assistance, support for housing, employment assistance, wheelchair and bicycle repair, pet care, medical foot washing and more. Lunch was served all day, and there was a live band. The purpose was to allow people struggling with poverty, homelessness and addiction the chance to take care of tasks which are necessary to survival and well-being. UGM wanted to reduce financial, geographic and other barriers. Next week, UGM will hold an official opening ceremony for their newly renovated building at 616 East Cordova Street. “For many women,” says UGM, “children are the drive behind the desire to overcome addiction and live clean and sober.” The Sanctuary Program, in the newly renovated Women and Families Centre, consists of two Stabilization Programs for women seeking a recovery-centred life. Phase One, a gap-filling and housing program for women in between recovery and detox, was announced in March; and on June 25, Phase Two will be announced. The cost of renovations and seed funding to run the program for the next three years is $2,526,000; just over $2.3 million has been raised to date. 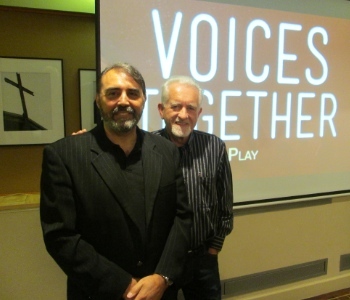 Giulio Gabeli (left) and Dave Carson at the Voices Together lunch at Coastal Church. Voices Together is going ahead; but not until next year. You’re on your own for Canada Day this year, but prepare for another massive expression of Christian unity July 1, 2015. Organizers of the Voices Together movement hosted lunches at Coastal Church in Vancouver (June 18) – which I attended – and Calvary Worship Centre in Surrey (June 19), in order to bring the assembled pastors and ministry leaders up to date with plans. He added that “God is giving us 12 months to really get our act together.” He said the Voices Together team is considering the Pacific Coliseum for next year, though Rogers Arena is also a possibility. And he echoed Darrell Johnson of First Baptist Church, who had predicted that we will be gathering in BC Place before too long. 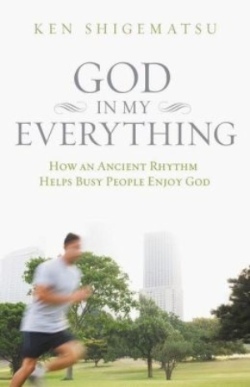 Speaking of Ken Shigematsu, his God in My Everything has just won the annual Word Guild award for best Christian Living book. Congratulations! The Word Awards Gala took place June 11 at World Vision Canada headquarters in Mississauga, Ontario. God in My Everything had its genesis in a sermon Ken preached shortly after his return from a pilgrimage to the holy sites of Ireland. The trip introduced him to the ancient monastic practice of a rule of life, which helped monks develop unique personal rhythms for lives as individuals and a community. He began developing a rule for his own life. When he shared the idea with his congregation, he received a steady stream of requests for more information – beyond anything he has ever experienced as a pastor. 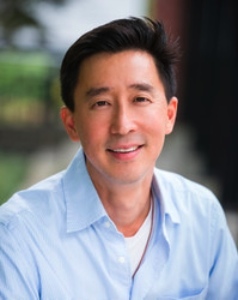 The practice has allowed Ken to cultivate a prayerful attitude and greater sense of freedom in all that he does despite a demanding schedule as a senior pastor of a 2,000-member congregation, a mentor to younger Christian leaders, and a husband and father. I have written about the book here and here. Irwin Prize, Canada’s largest literary prize for Christian writers. Other award recipients from Metro Vancouver are Kevin Schut of Abbotsford in the Culture category for Of Games and God and Christine Lindsay of Chilliwack for her historical novel Captured by Moonlight. Shelaine Strom of Abbotsford won for her article in the Personal Experience category, ‘Waiting: A Passionate Pause’ (Truth Media); Carolyn Arends of Surrey for her series in Christianity Today, ‘The Trouble with Cussing Christians’ and ‘You Probably Won’t Be Sent to Egypt’; and reporter Jeff Dewsbury of Langley in the News category for ‘Christian Law School Proposal Raises Discussion’ (Faith Today). Stronger Together says: “For four years now, granting partners have committed annually to this initiative that has seen more than $4m in grants being awarded to over 170 Canadian Christian charities. 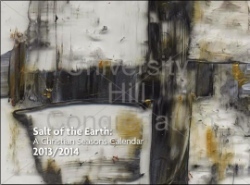 Artists are invited to participate in the upcoming issue of Salt of the Earth: The Christian Seasons Calendar for 2014/2015. This unique and beautiful calendar is produced by University Hill Congregation; view a sample of the current Christian Seasons Calendar here. “Interested artists are encouraged to offer artwork that interprets scripture readings and themes within the Christian Year. A list of the scripture readings used in Year B of the Revised Common Lectionary can be found here. The deadline for submission is June 30. Check out pastor Ed Searcy’s Holy Scribbler blog for more information.